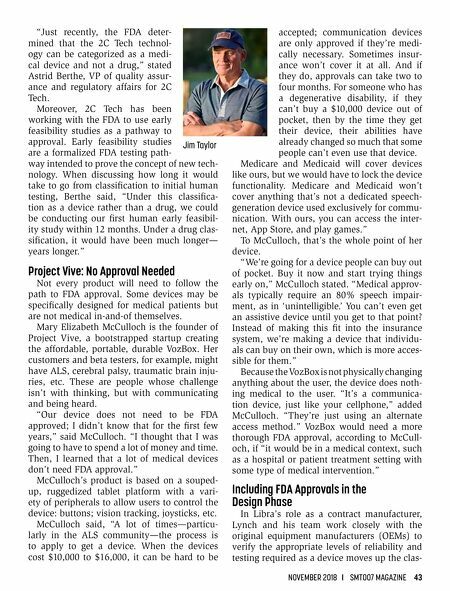 42 SMT007 MAGAZINE I NOVEMBER 2018 510(k) "requires device manufacturers… to notify FDA of their intent to market a medi- cal device at least 90 days in advance. This is known as premarket notification—also called PMN, or simply 510(k). The premarket notifi- cation allows FDA to determine whether the device is equivalent to a device already placed into one of the three classification categories." The 510(k) process could be considered one of the more well-known approval processes for medical products. But there are other paths that a design team could follow to complete FDA approval successfully, all of which are worth exploring. We'll look at examples from two new compa- nies: 2C Tech and Project Vive. Project Vive is a Pennsylvania-based boot- strapped startup creating the VozBox, an affordable, portable, durable communication device for people who have lost the ability to speak. 2C Tech's (Irvine, California) product —although not strictly electronic—delivers an electrical stimulus to the patient's retina. Both products enhance a patient's sensory control in various ways and take different paths through the FDA approval process. Strict R&D at 2C Tech 2C Tech has been developing a quantum dot (QD) technology that helps patients with degenerative retinal disease to see. The quan- tum dots are semiconductor crystalline struc- tures a few nanometers in size. These quan- tum dots are injected into the retina where they absorb light and create an electric signal that the retina will recognize as a single wavelength. In essence, the patient achieves increased clar- ity in their monochromatic vision. Jim Taylor, 2C Tech CEO, observed, "Most medical devices progress by 'evolutionary steps' rather than whole new concepts. If the innovators decided they had a way to make a better implantable defibrillator, for exam- ple, then a lot of the groundwork and pathway have already been pioneered; the task then is to innovate while leveraging that prior experi- ence." The 2C Tech technology may be extremely passive in its function, but it is injected into the patient's tissues, making FDA classifica- tion of the technology trickier. Classification can have a dramatic impact on the develop- ment cycle for a medical product. 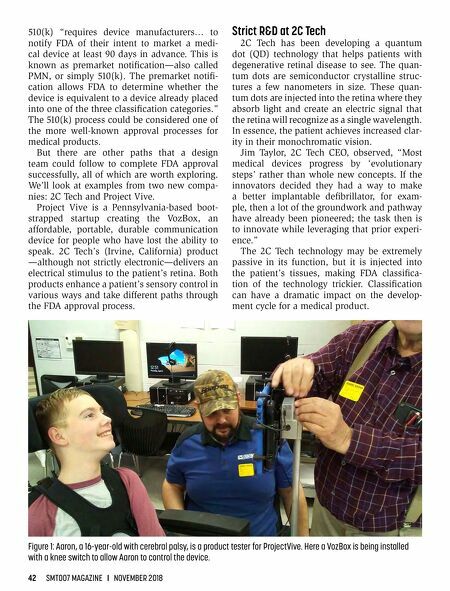 Figure 1: Aaron, a 16-year-old with cerebral palsy, is a product tester for ProjectVive. Here a VozBox is being installed with a knee switch to allow Aaron to control the device.